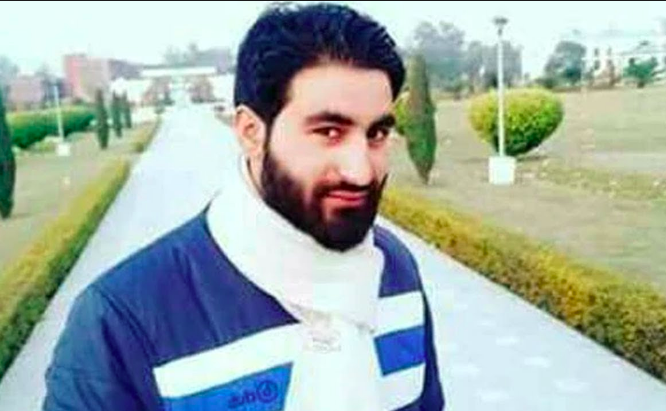 Manan Wani, who went missing from Aligarh Muslim University earlier this year, was killed in an encounter on Thursday. 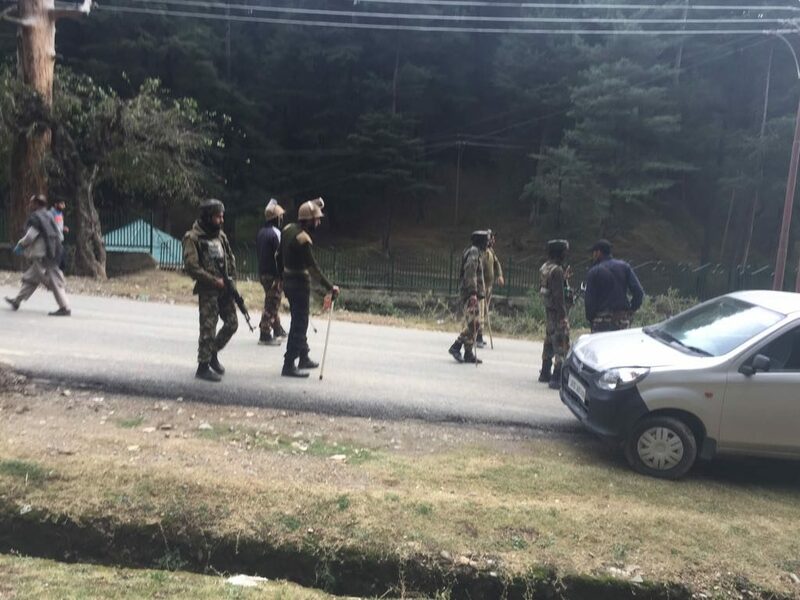 Tikipora Lolab: Early Thursday morning, reports of two militants being trapped in a house at Shatgund village of north Kashmir’s Handwara began to pour in on social media. Among the two militants, according to reports, was 29-year-old militant commander of the Hizbul Mujahideen, Manan Wani. Around forenoon, the gunfight was reported to be over, yet the police did not confirm the identity of the deceased militants. The Wire got in touch with two senior police officers, who neither confirmed nor denied the presence of Wani in the encounter. Rumours about Wani and the son of senior Hurriyat leader Ashraf Sehrai being gunned down in the encounter were rife, till finally, around 2 pm, the police confirmed that among the two militants was Wani, a research scholar at Aligarh Muslim University (AMU) who had joined the militant outfit earlier this year. The news spread across nearly all of north Kashmir where stone pelting and clashes between protestors and government forces were reported in multiple areas. In Drugmulla area alone, protestors had set up four blockades and were pelting stones at vehicles carrying troops. Cars of locals, as well as journalists, were allowed to pass. The journey was, however, curtailed at Bab-e-Lolab (Gateway of Lolab), which houses a Special Operations Group (SOG) camp and serves as an entry point into Lolab Valley. Reporters, both from the national and local media, were stopped and barred from moving ahead towards Tikipora, Wani’s residence. Journalists were asked to park their vehicles by the roadside. This was around 3 pm. Journalists then contacted senior officials of the police force as well as the state government urging them to allow them to pass, but the efforts were in vain. “You will have to wait for sometime,” said a senior police officer, while another said, “It won’t be long before you are allowed to go”. A senior home ministry official said the decision to not allow the press must have been taken by the local police. On the sidelines, the SOG men dealt with scores of people who were trying to enter Kupwara to attend the funeral, even using force on a couple of occasions. Internet too was snapped in north Kashmir. “We have been directed by our seniors not to allow even a single journalist into Kupwara. Maybe after the funeral is done you can enter,” the press was told by one of the SOG men. Finally, around 6:30 pm, journalists were allowed to move towards Tikipora but not before the police were certain that Wani’s funeral was over and he had been buried. “This delay and confusion over who actually was trapped (in Shatgund) seem to be the plan from the beginning,” said a reporter from the local media, who spoke on the condition of anonymity. On the way to Tikipora, cavalcades of around 200 cars and mine-trucks were returning from the funeral. This was followed by thousands of people, including women, who were making their way back home on foot. Residents whose homes were located on the main road had set up around a dozen booths that were serving water to the people who had attended the funeral. As Tikipora, which is located around 22 kms from Gateway of Lolab, approached closer, the roads were littered with shards of glass and stones. The air was filled with remnants of tear gas and pepper smoke. In the desolated Tikipora village, around 5-6 people were standing on a road. This was where Wani had grown up. The journalists were accompanied by relatives and neighbours of Wani to his home, where around two dozen men were sitting quietly. 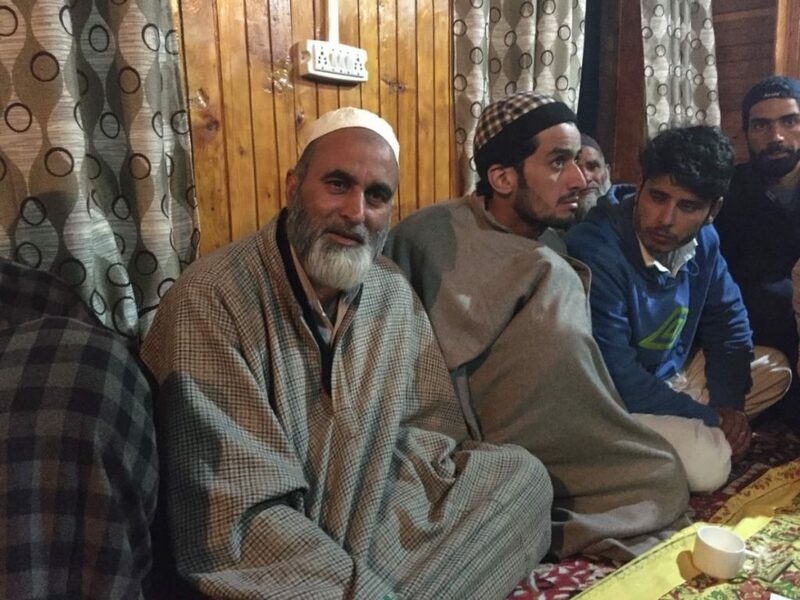 In the middle of the room was 56-year-old Bashir Ahmed Wani, Manan’s father. “Manan was not a man, he was an icon,” said Bashir Ahmed before breaking down. “I have lost an asset today and nothing or no one can bring him back,” he added. Bashir Ahmed is a lecturer by profession and teaches Urdu at a higher secondary school in the locality. He claimed that he was approached by some personnel of the army, the police and intelligence 10-15 days ago and was told about Wani’s presence in the area. “They told me to ask him (Wani) to surrender. I told them that I wasn’t in contact with my son. Neither has he reached out to us or did we ever try to send a message to him. The authorities put tremendous pressure on me in the last two weeks but I told them that Manan has made his choice. I won’t ask him to surrender,” said the militant commander’s father. Relatives and neighbours were outraged at the behaviour of the police which they termed as deceptive. “They didn’t inform us what was happening. They were killed and around 1:30 pm, they told us to receive the body at Chaogund area,” Wani’s cousin said. The J&K Police released a statement about the encounter. “Police and Security Forces in the wee hours today launched a cordon and search operation at Shartgund Bala area of Qalamabad in Handwara. During the searches, the hiding terrorists fired on the search party which was retaliating, leading to an encounter. Consequently, the civilians in the nearby areas were evacuated. Further, following the SOP, attempts to make the terrorists to surrender failed. In the ensuing encounter, two terrorists were eliminated. In the operation no collateral damage has taken place,” the police said. The operation was carried out by 30 Rashtriya Rifles and J&K Police SOG. Soon after, clashes erupted in Kupwara, locals said. “There were so many people present that I didn’t get to see his body. I was busy trying to control the attendees. It was madness and at one point I thought his body will be taken away,” said Wani’s father. His relatives added that they wanted to bury Wani at the martyrs’ graveyard which is two kilometres from here but couldn’t do so due to the crowds. “We buried him in a grave nearby,” said one of his relative. “It was sheer madness,” reiterated the slain militant’s father. “But the most disturbing part was when I noticed that a group of people was trying to sabotage and delay the funeral proceedings. These people were similar to those who were present at the funeral of professor Mohammad Rafi where I was present,” he said. Bashir Ahmed was referring to the killing of a Kashmir University professor who was gunned down hours after joining the Hizbul Mujahideen. “We need to introspect. Should we only fill our graveyards? Haven’t enough boys died already,” Wani’s father said while cousins of the slain militant wept silently. Wani had gone missing from AMU earlier this year, where he had been studying Applied Geology. A few days later, his photograph, holding what appeared to be an AK assault rifle, appeared on social media. “This year he would have received his doctorate,” Wani’s father said. All images by Azaan Javaid. 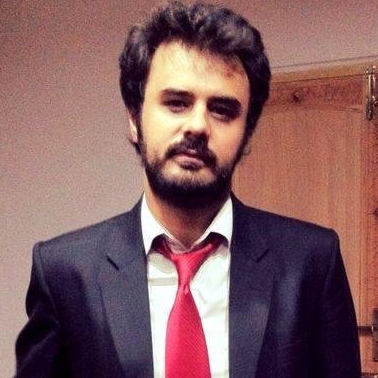 Azaan Javaid in a Kashmir-based journalist and has previously reported from New Delhi for Hindustan Times, DNA, Deccan Herald, Statesman and Caravan magazine. He has covered Ministry of Home Affairs, Central Bureau of Investigation, National Investigation Agency, Enforcement Directorate and major crimes in North India.